This really isn't a blog about cats. This is about turning our suburban home into our homestead one baby step at a time. We just happen to have a cat or two or eight. But that is down from our high water (cat) mark of seventeen. Yes you read that right! Now before you write me off as a crazy cat lady (which I may very well be...but that is a post for another day) let me explain. Our neighborhood sits next to some old farmland. A few years ago a few of the smaller farms were purchased by a developer (which still hasn't been developed by the way). Barns were torn down and the families moved out. The farm cats however remained left to their own devises. Most of the cats were killed by cars in their search for food. Those that remained were in bad shape. Cats don't live well off hunting. Cats kill for fun, not for food. Well fed farm cats are killing machines. Unfed farm cats die young. Several of these farm cats made their way to our patio to eat stale bread and seed left out for the birds. It was the emaciated mother cats trying to nurse and feed themselves any way they could that broke our hearts. Over the next three years we rescued twenty-three of these abandoned farm cats; some came willingly, most not so much. Each cat was given its shots, neutered, and was socialized. We placed fourteen cats in good homes. 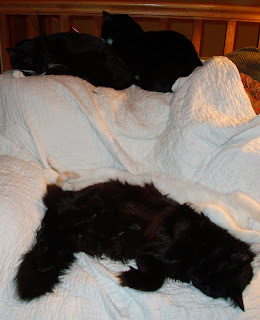 The older cats were given lots of love in our home but each of them died within two years from (at least according to our vet) complications that arose from malnutrition as kittens. Of the eight left in our home, we consider three of them our cats (we had them before the farm cat saga began but even two of the three are rescue cats too). The others are interlopers in search of a permanent home. At least that is what we tell ourselves. The likelihood of us placing any of these cats in a new home is ... well let's just say we have stopped looking for new homes. So on this journey you will often meet the cats on the homestead. I hope you aren't allergic! Vinegar weed killer? Wrong answer!